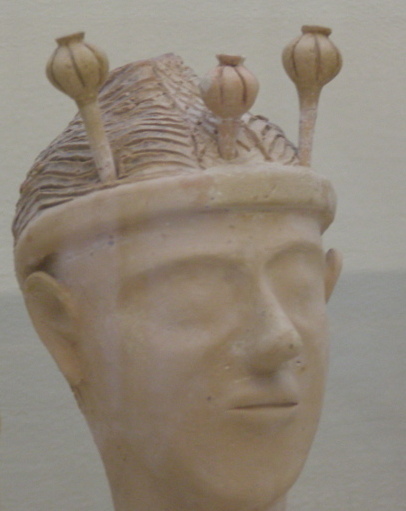 Aesthetically, the “Poppy Goddess” is similar to two other Minoan female figurine types, the so-called “Bird Goddess” and “Goddess with a Cone and Horn of Consecration.” The “Poppy Goddess” is one of the artifacts that archaeologists cite to support the practice of opium use in Minoan culture. 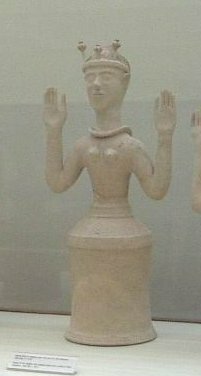 She was discovered, along with four other female figurines, at Gazi in July 1959. In the same room as these figurines, a heap of coal was found as well as some vertical vessels thought to be used for the inhalation of opium vapors.2 Classical texts reveal that opium was used for a variety of purposes in the Mediterranean, including use as a hypnotic drug to induce sleep. On top of the Poppy Goddess’s head rest three moveable capsules of poppies. A 1967 archaeological study by Kritikos and Papdaki confirmed that these heads related to one specific type of poppy used for opium in ancient times.3 This same study also pointed out that the colors of the vertical notches also correspond to the dried juice of the poppy.2 Additionally, these archaeologists suggested in the study that the goddess might have closed eyes, to represent sleep. I think this is an interesting idea, but I would like to see if microscopic traces of paint have been on this statue. 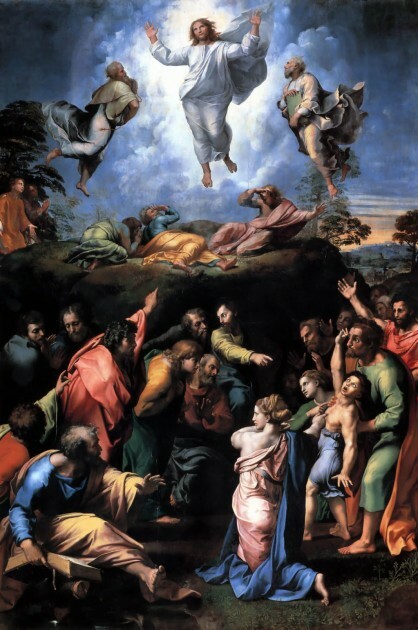 It could be that pupils were painted onto the statue that have disappeared over time. Why are the opium capsules moveable? Was there an additional function or purpose for these capsules, apart from their placement in the head? Are the capsules moveable simply because they were fashioned separately? Does the woven cap have any significance? The artist took great pains to decorate this cap with incisions, whereas much of the body has a smooth texture. I think it is also important to note that the poppy, because of its multiplicity of seeds, could also serve as a symbol of fertility in ancient times. 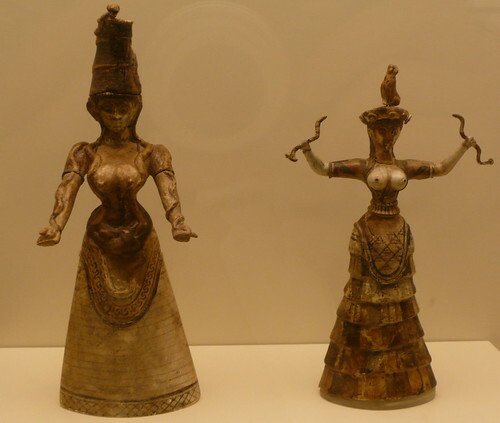 Given the associations with other Minoan female figurines and fertility (most notably the famous Minoan “Snake Goddesses,” one of which also appears with upraised arms as a symbol of power), it is important to acknowledge that this statuette might serve a similar function. Do you know anything else about this figurine or the other terracotta figurines found on Crete? 1One relatively recent discussion on the Minoans and opium is by Helen Askitopoulou, Ioanna A Romoutski, and Elini Konsolaki, “Archaeological Evidence of the Use of Opium in the Minoan World” in International Congress Series 1242, (December 2002): 23-29. Article can be found HERE. 2 We also know that ancient cultures would ingest the “juice” of opium, and some think that smoking opium was another method of intake. See P.G. Kritikos and S.P. Papdaki, “The History of the Poppy and of Opium and Their Expansion in Antiquity in the Eastern Mediterranean Area,” in Journal of the Archaeological Society of Athens: 1967. Available online HERE.